The pancreas is an abdominal glandular organ with both digestive (exocrine) and hormonal (endocrine) functions. In this article, we shall look at the anatomy of the pancreas – its structure, anatomical position and neurovascular supply. 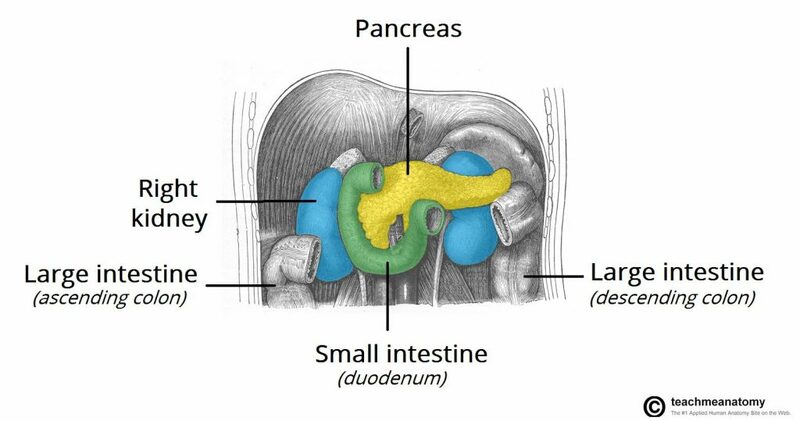 The pancreas is an oblong-shaped organ positioned at the level of the transpyloric plane. With the exception of the tail of the pancreas, it is a retroperitoneal organ, located deep within the upper abdomen in the epigastrium and left hypochodrium regions. Stomach – Separated from the pancreas by the lesser sac, the stomach and pylorus lie anterior and to the pancreas. Spleen – located posteriorly and laterally. The lienorenal ligament is formed from peritoneum and connects the spleen to the tail of the pancreas. The aorta and inferior vena cava pass posteriorly to the head of the pancreas. The superior mesenteric artery lies behind the neck of the pancreas and anterior to the uncinate process. 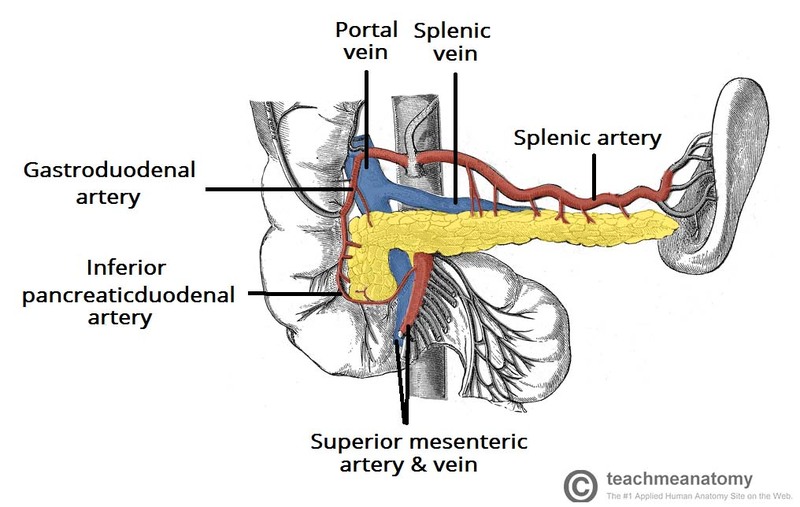 Posterior to the neck of the pancreas, the splenic and superior mesenteric veins unite to form the hepatic portal vein. As it journeys from its origin at the celiac plexus to the splenic hilum, the splenic artery traverses the superior border of the pancreas. Head – the widest part of the pancreas. It lies within the C-shaped curve created by the duodenum, and is connected to it by connective tissue. Uncinate process – a projection arising from the lower part of the head and extending medially to lie beneath the body of the pancreas. It lies posterior to the superior mesenteric vessels. Neck – located between the head and the body of the pancreas. It overlies the superior mesenteric vessels which form a groove in its posterior aspect. Body – centrally located, crossing the midline of the human body to lie behind the stomach and to the left of the superior mesenteric vessels. Tail – the left end of the pancreas that lies within close proximity to the hilum of the spleen. It is contained within the splenorenal ligament with the splenic vessels. This is the only part of the pancreas that is intraperitoneal. The exocrine pancreas is classified as a lobulated, serous gland which produces digestive enzyme precursors. It is composed of approximately one million ‘berry-like’ clusters of cells called acini, connected by short intercalated ducts. The intercalated ducts unite with those draining adjacent lobules and drain into a network of intralobular collecting ducts, which in turn drain into the main pancreatic duct. 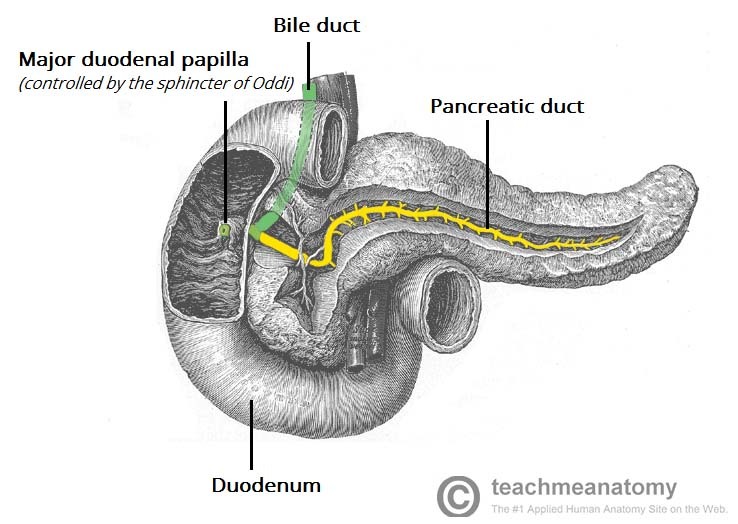 The pancreatic duct runs the length of the pancreas and unites with the common bile duct, forming the hepatopancreatic ampulla of Vater. This structure then opens into the duodenum via the major duodenal papilla. Secretions into the duodenum are controlled by a muscular valve – the sphincter of Oddi. It surrounds the ampulla of Vater, acting as a valve. The pancreas is supplied by the pancreatic branches of the splenic artery. The head is additionally supplied by the superior and inferior pancreaticoduodenal arteries which are branches of the gastroduodenal (from coeliac trunk) and superior mesenteric arteries, respectively. Venous drainage of the head of the pancreas is into the superior mesenteric branches of the hepatic portal vein. The pancreatic veins draining the rest of the pancreas do so via the splenic vein. The pancreas is drained by lymphatic vessels that follow the arterial supply. They empty into the pancreaticosplenal nodes and the pyloric nodes, which in turn drain into the superior mesenteric and coeliac lymph nodes. Pancreatitis creates severe epigastric pain which often radiates to the back, nausea, vomiting and diarrhoea. Treatment involves supportive measures such as IV fluids and analgesia. Antibiotics are rarely required as most cases are not due to infection The underlying cause will then also need to be treated. Which regions of the abdomen does the pancreas lie in? How does the spleen connect to the pancreas? Which is the only part of the pancreas that is intraperitoneal?